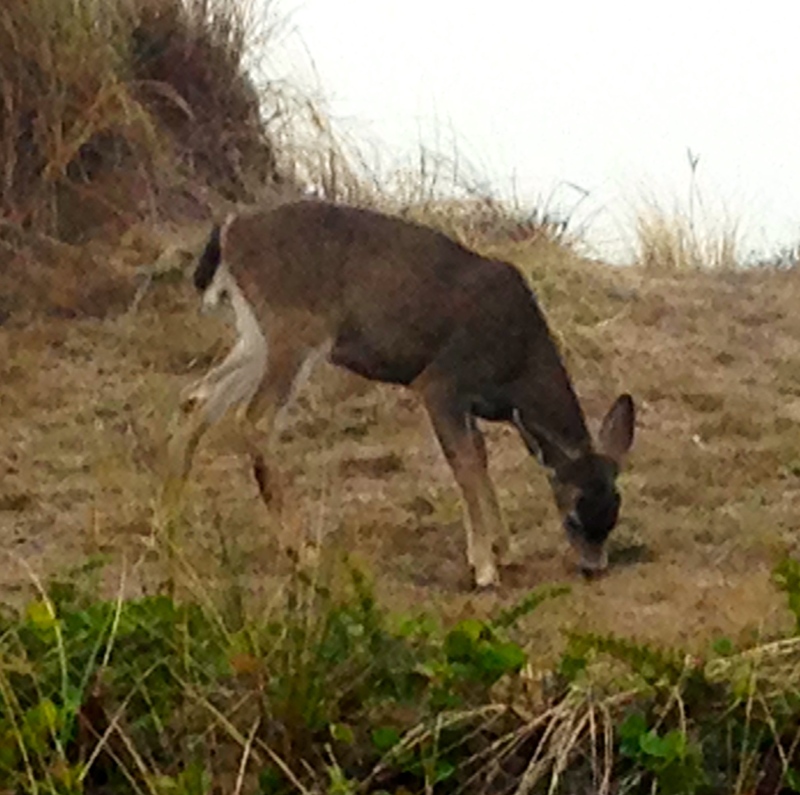 Is there anything that Bandon Dunes DOESN’T have? You never get tired of ocean-front views, like this one on Bandon’s Pacific Dunes course. 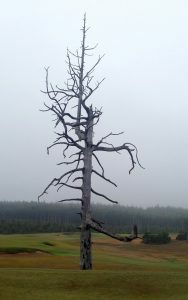 BANDON, Oregon – There’s definitely a lot to say about Bandon Dunes, the very unique multi-course facility on the shores of the Pacific Ocean. In short, though, it has most everything. There’s four quality walking-only 18-holers, a 55-acre practice range, the 100,000-square foot Punchbowl putting course, a 13-hole par-3 layout called Bandon Preserve that was chosen as Best U.S. Short Course by Golf Digest magazine, one of the biggest caddie programs in the United States, dining at six restaurants and lounges, a variety of comfortable lodging and – one of the many factors that separates Bandon Dunes from other American resorts – everything is so close together. You could easily drive your car from one place to another (as we did), but if you don’t want to do that there’s a shuttle system that works just fine. Bandon Dunes was created by Chicago’s Mike Keiser, who took it on after his unique but much more modest Dunes Club in Michigan emerged a success. Now Keiser is planning another Bandon-type facility, Sand Valley in Wisconsin, but that’s a topic for another day. 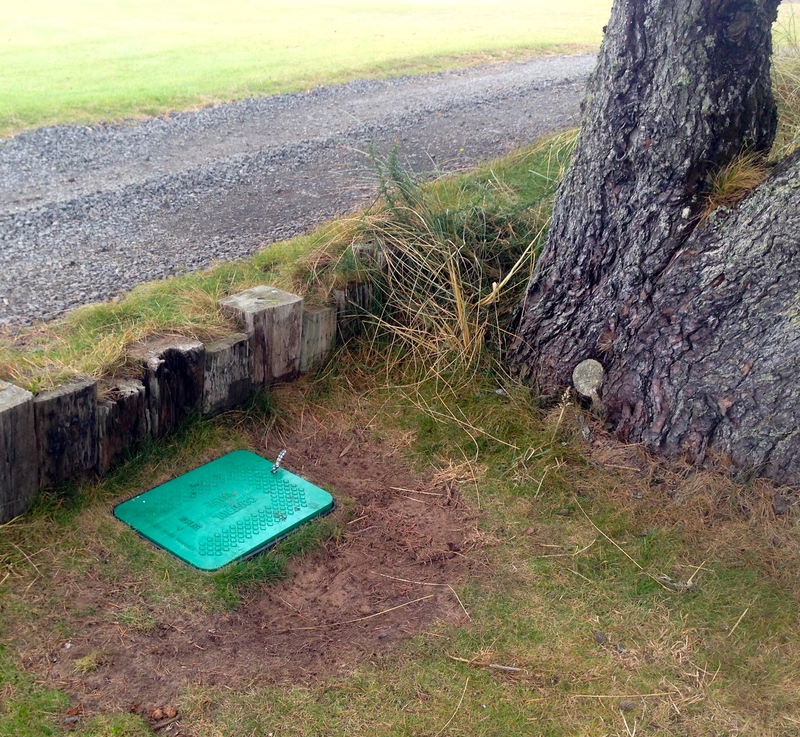 Beware of “the Whammer.” The out-of-the-way box is no longer a Bandon Dunes secret. For now we’ll delve into Bandon and its variety of offerings. This resort is well-conceived, well-run, well-presented and well-received. In fact, none may do it better. 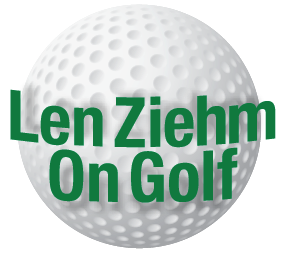 The resort’s logo — “Golf As It Was Meant To Be’’ – fits to a tee. There’s one touchy subject for those who run the place, though. They shy away from citing one of its courses as better than another. Most such multi-course facilities have a designated championship course and then one (or a few) others. 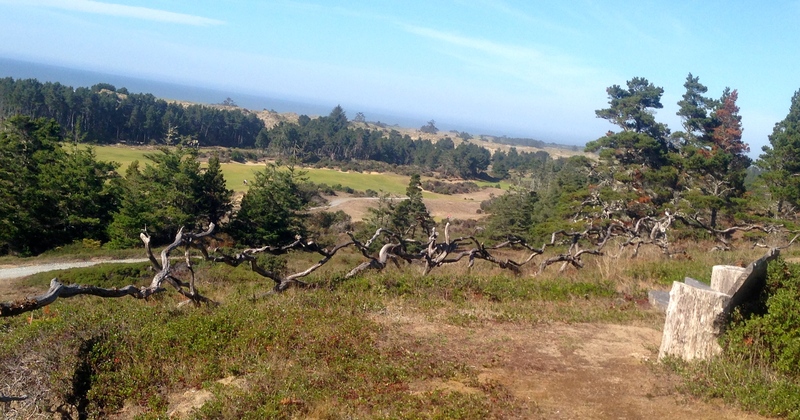 Bandon considers its four courses as equals, and prices them that way. The equality contention was underscored when the U.S. Golf Association recently awarded the resort the 2020 U.S. Amateur. The resort got the prestigious tournament – its sixth USGA championship — but the two 18-holers necessary to its staging have yet to be designated. Any of the four could be chosen, since they’ve all hosted at least one previous USGA event. 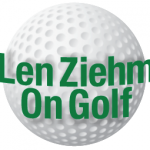 Maybe favoritism should be avoided, but golfers aren’t that way. They don’t see all courses as equal, and one of the fun parts of the game is discussing the strong points and shortcomings of each one. I’d be remiss to not do that here, after a five-night four-course fall visit. Golf Magazine had all four Bandon courses ranked in its top 49 U.S. courses. Golf Digest had all four in the top 74 of its Top 100 in the U.S. and all in the top 14 of its Top 100 U.S. Public Courses. Golfweek had all four in the top 22 of its Best Modern Courses. Pacific Dunes was the top-ranked Bandon course in all those polls. I’m entitled to my opinion as well, and I’ll give it to you – but you’ll have to wait. Here’s my thoughts on the courses – given in the order in which they were played. Flashes of yellow form a stunning backdrop on the No. 17 hole at Pacific Dunes. 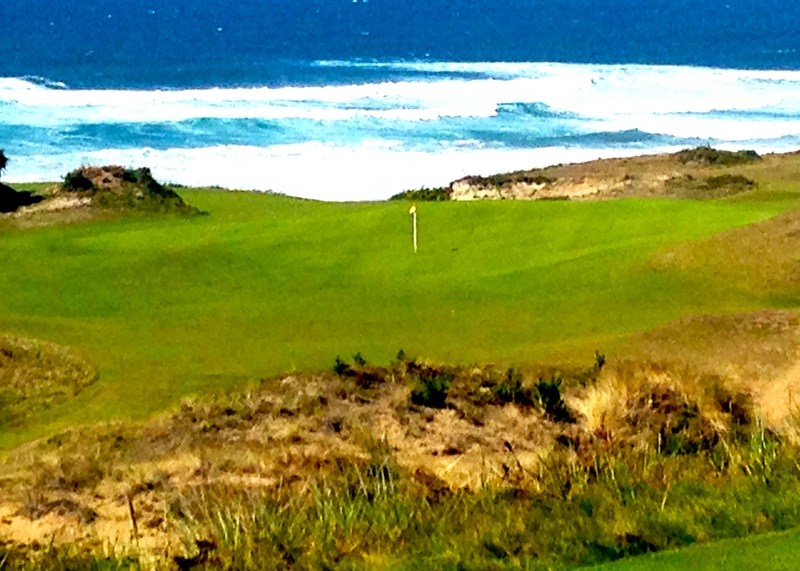 PACIFIC DUNES: Our first tee time was on what we were told was the best, most beautiful and toughest of the layouts. We caught it on an extremely windy day, but it was certainly playable and lots of fun. The views of the Pacific were plentiful and stunning. One thing that set this round apart from all others that we’ve played was that we were told it was permissible to use your push/pull carts on the greens – something that can be done on all the Bandon courses. We didn’t really feel comfortable doing that at first, but the greens were hard and we couldn’t discern any damage being done to the putting surfaces. It was also certainly a convenience in getting around the courses. The layout, designed by Tom Doak and opened in 2001 as the resort’s second course, was unusual in that there were four par-3s on the back nine. (The layout is still a par-71). Interestingly, the most memorable of the short holes on the course didn’t offer an ocean view. On No. 17 you hit towards a stunning background of gold wildflowers. The bench behind Bandon Trails’ No. 14 tee marks the spot where Mike Keiser decided to build his Bandon Dunes Resort. BANDON TRAILS: The creation by the design team of Bill Coore and Ben Crenshaw opened in 2005 – a par-71 that measures only 6,765 yards from the back tees. It’s much different than Pacific Dunes in that there are no striking ocean views. The most notable features are the liberal use of manzanita, particularly at the par-3 fifth hole, and the abundance of elevated tees. They gave lots of holes a special look from the outset. Bandon Preserve, the par-3 course, adjoins this layout and offers the best opportunity to play extra holes on the same day. Most notable spot on the course, though, is the long passageway to the No. 14 tee. Behind the back tee on that hole is a bench where Keiser got his first dramatic view of the property that would become the Bandon Dunes Resort. It was also the spot where Keiser had his epiphany: this would be where he’d build his next golf facility. Given developments of subsequent years, this spot should be looked on as hallowed ground in the golf world. 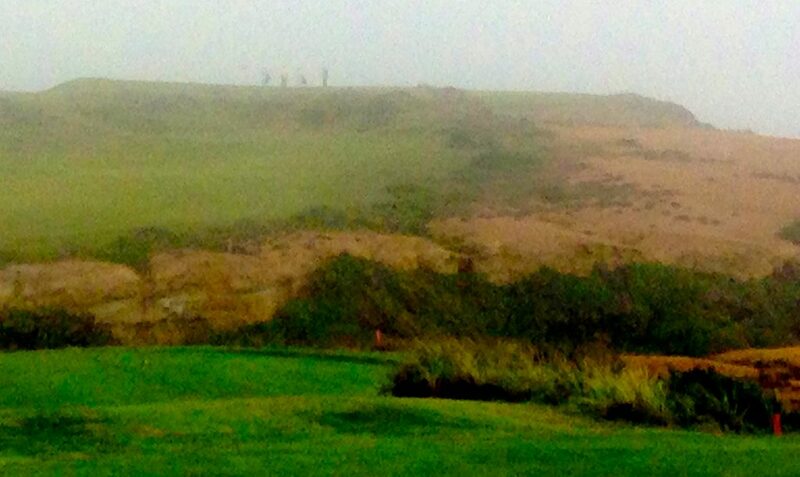 Even on a foggy day the approach to Bandon Dunes’ No. 16 hole is definitely memorable. BANDON DUNES: This was the first course built on the property, in 1999. Scotland’s David McLay Kidd, still shy of his 30th birthday, was the architect, and our first thought was that it didn’t quite measure up to the first two layouts we played. Then again, we really didn’t see it all because fog had set in just before teeoff and we had trouble seeing the holes we were playing for quite awhile. This deer had no fear of golfers. Anyway, this one had its charms. There was more animal interaction on this layout than the others. Three deer greeted us at No. 3, getting close enough to startle us. They weren’t afraid of golfers, that’s for sure. Later a squirrel seemed on the brink of jumping on my shoe. A couple footnotes: No. 12 – a par-3 – was the first hole built on the property and No. 13 is the only hole on any of the courses without a bunker. And No. 16, a short par-4 requiring a tee shot over a ravine and an uphill approach with one of the best ocean views, wound up my most memorable hole of the 72 we played. And then there was “the Whammer.’’ The caddie in our group alerted me that a “secret’’ hole had been dug long ago near a tree to the right of the No. 10 fairway. Though it was covered, it stirred my curiosity. So, over I went, lifted the cover and found an assortment of odds and ends including a bottle of scotch. Some Bandon devotees apparently created the hole during an early outing and it has grown into the stuff of legends. The use of wooden planks gave Old MacDonald’s bunkers a distinctive look. OLD MACDONALD: The resort’s newest course – Old MacDonald opened in 2010 – is much different than the others. It came off a joint design effort by Doak and Jim Urbina and the name came from Charles Blair MacDonald, creator of America’s first 18-hole course at the Chicago Golf Club in 1892. MacDonald was the first man to describe himself as a golf course architect, and he did plenty of other courses. 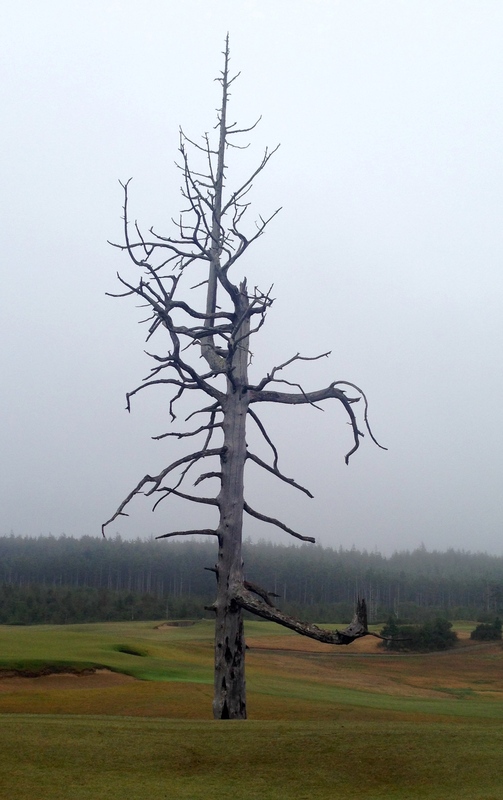 This dead tree is a landmark on several holes at Old MacDonald. Old MacDonald is no replica of any of his other courses but more a tribute to his design work overall. The fairways are huge and so are the greens. In fact, at 250,000 square feet, Old MacDonald has the largest greens complex in the world. Funny thing about Old MacDonald – or maybe it’s just me. I had easily my best shot-making round on this layout, but also had my highest score on the four Bandon layouts. The greens are the thing here. Sometimes it feels like you’re too much at the mercy of the fickle slopes that are all over the course. That’s when things aren’t going your way. When the ball is bouncing right you get the most exhilarating feeling possible on any of the four layouts. Experienced caddies are a nice amenity most anywhere but they are a borderline necessity here for first-time players. We didn’t use them, and they would have definitely come in handy in determining the proper target lines – especially on some of the blind shots that were more prevalent on this course than on any of the others. FINALLY, OUR RANKINGS: No. 1 – Pacific Dunes, because you can’t beat the views; No. 2 – Old MacDonald, because it was so different (though I’m no fan of the blind shots presented there); No. 3 – Bandon Trails, at least in part because there were more holes to play at this stop with the adjoining par-3 also available; and No. 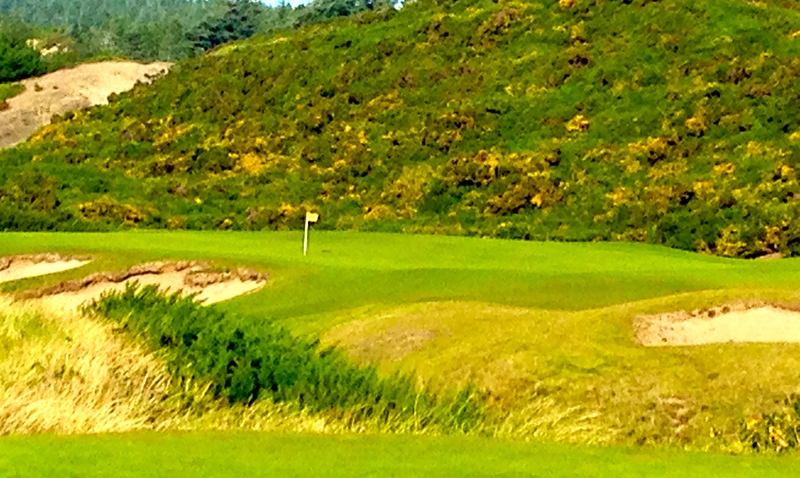 4 – Bandon Dunes, because it’s hard to judge something you can’t see. Fog ruled the day when we played there. Does it really matter if one course is “better’’ than another? Certainly not if you’re at Bandon Dunes. This resort has an abundance of riches. 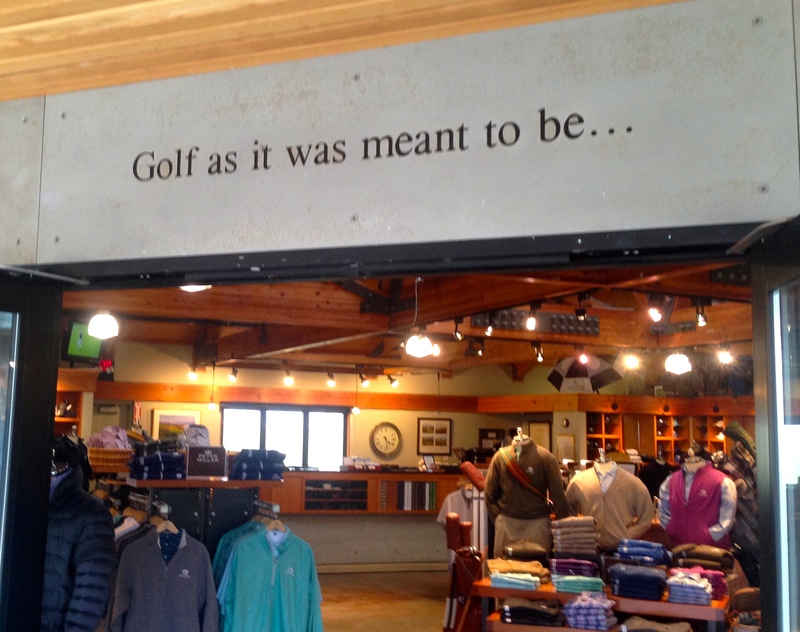 The message entering the Bandon Dunes pro shop sets the proper tone for the golf that is played there.